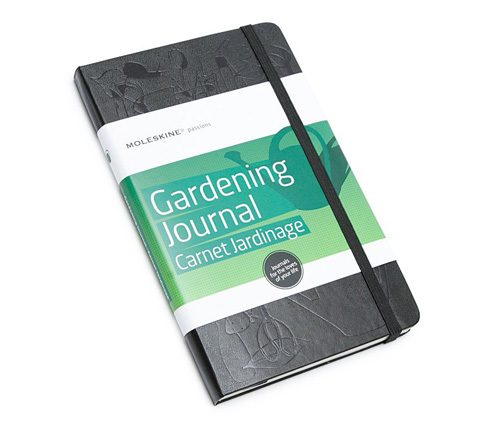 Keep track of what you grow with a handy journal like this one from Moleskine. 1. Know what works, and what doesn’t, in your garden. Garden journals allow you to take notes about your plants, including what the sprouts look like, how large they get, and anything else you wish to write about them. Although seed packets and plant tags can give you this information, there’s nothing like growing them yourself to see each plant’s quirks. For example, I tried growing green beans this year and for some reason, they’ve had trouble sprouting. So, I wrote this down in my garden journal so that next year, I can adjust when I start them or buy plant starts at the nursery. My snap peas, on the other hand, are growing like gangbusters, so next year I plan to give them much more space. 2. Prevent overwatering. Keep track of when you water, fertilize, mulch, etc. in a garden journal so that you can avoid overdoing it. While water, fertilizer, etc. are beneficial to your plants, giving them too much of a good thing can make them more susceptible to pests and disease. Also, note any rain that you receive as well so that you don’t double up on your watering schedule. It’ll keep your plants from becoming water logged and keep the pests and disease down. 3. Reduce pests. My garden journal has a neat-o section with gridded pages where I can draw my current garden, and plan my crop rotation for next year. Crop rotation is important to keep pests in check. When you plant crops in the same place every year, pests are able to attack your plants year after year. However, if you plant crops in a different spot in the garden each year, it’ll take longer for the pests to find their favorite plants, as long you make sure that you don’t plant something from the same family in that spot. For example, I won’t plant my peas in the same spot next year; instead, I’ll probably plant sunflowers or corn or tomatoes—something that grows tall and won’t overshadow the plants in front of it. This way, the bugs that love my snap peas will say, “hey, wait a sec, where’s our dinner at?” and they won’t be tempted to hang around. PreviousGood Fences Make Good Neighbors?